Pirate101’s Summer Update just released on test realm, and with that comes new content for PvP. Although no PvP specific changes have been made that we know of (a shame honestly), and there are no new trainable powers or new companions for any class, this update is poised to shake up PvP a good bit. Buccaneer: Not much to say here. Mojo buffs don’t provide enough of a benefit to buccaneers (only assassin bleeds and heals would be affected) and purge magic + aoe drain isn’t strong enough on its own to get buck to use Scratch on a main team, in ranked or spar. However, the Magic Attack (Radial) power is valuable tech against summons, and could very easily make its way into a buck’s toolkit (or any class’ toolkit) against witchdoctor and privateer summon builds. Swashbuckler: Scratch was already a niche companion on swashbuckler before his promotion. 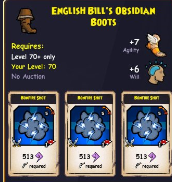 Boosting poisons, bleeds, and heals was very much worthwhile for a swashbuckler to run, especially if they coupled Scratch buffed poisons with a Sprocket Key. This would allow their shroud to do tremendous damage, and with the key’s Purge Magic, could force the opponent to use multiple protection buffs to survive. This update to Scratch, however, could make him a meta companion. The fact that Scratch now has purge is HUGE for Swashbucklers. 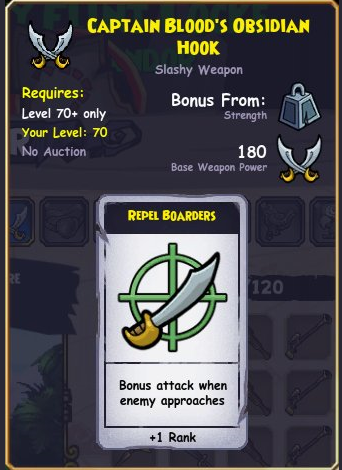 Since he already has to be adjacent to a buckler to get a buff, it’s very likely that Scratch would be able to use his purge as effectively as a buckler with Sprocket Key could. This either frees up a gear slot for bucklers to run an extra revive, an extra hide+poison, or even a vicious charge. They could also run 2 copies of Purge Magic, one for early game (Scratch’s) and one for late game (theirs) to combo with shroud. However, I’m not entirely convinced that Scratch will become a dominant force on swashbuckler teams. In ranked PvP, his low base movement range will make it nearly impossible for bucklers to use him as part of an early-game rush (if they want his purge to play a part), and a full rushing team consisting of Goro, Fan, Nausica will be great at disrupting other classes’ Scratch based strategies. In the spar chamber, early rushes are more difficult to pull off, so it might become worthwhile to “take it slow” and run Old Scratch. Privateer: Scratch is already a “meta” companion for privateers and this update isn’t going to change that whatsoever. The addition of purge to scratch makes it much less necessary for privateers to run purge (a semi-common occurrence already). In addition, they can make sure this purge is effective and usable in the late game since they can use their forts, absorbs, and heals to protect Scratch. Musketeer: A common theme in this article will be Musketeer getting answers to many of the problems they currently face in PvP. The problem being addressed here is Nausica. A buffed Nausica still shreds musket teams, and although Emmet and Exeter helped to address that slightly, that centaur continues to wreak havoc against muskets. This forced muskets to dedicate 1 gear slot to a copy of purge magic. Now, they no longer have to. Scratch’s purge frees up that purge slot for something else (an extra fort or heal most likely). In addition, musket can use this purge in conjunction with a hidden Contessa and Chantal’s super/sniper shots to do massive damage to an unsuspecting unit. Witchdoctor: Well, the Scratch promotion certain makes witches better, but how much so? I don’t see witch really needing a second copy of purge magic and the drain Scratch gets isn’t a huge buff either. This gives witch a bit more flexibility and purge combo potential, emphasis on the word bit. 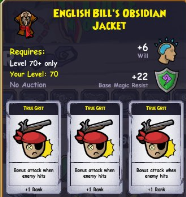 English Bill’s Obsidian Jacket- By far the most interesting of the new gear we know of, this robe gives +6 will, +22 magic resist, and 3 (yes, 3) ranks of True Grit to the wearer. This is an amazingly strong outfit for musketeers. It’s quite common to see quick draw 3 or true grit 3 units brought out in the musket matchup, in order to pressure and damage the pirate and/or any musketeer companions effectively. 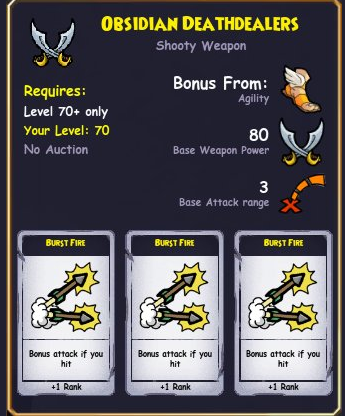 Giving musket pirates a way to get true grit 3 (chance to stun attacker upon being hit) without using multiple gear slots is a huge boon (they can still run the standard set of 2 forts, a heal, a hide or leviathan, an absorb, and a trick shot patch. This will make anti-musket units much less powerful and less common, since a musketeer pirate with burst 2, grit 3, quick draw 3 will annihilate any “anti-musket” companion. Instead, I predict that high movement, rushing companions will take their place, since early pressure seems to be the best way to stop muskets now. In addition, I see this as finding a home in hybrid buccaneer setups against musketeers and privateers that are musket companion heavy. True grit will only trigger from melee range, but it’s a great way to stun opposing Chantals, Nausicas, Emmetts, and Bonnies after you attack them. Once the duel gets down to buck pirate vs musket pirate, buck will have to worry much less about getting counter-chained when their burst fire triggers. Their strength will be so much higher than their opponent’s strength that the stun will be almost guaranteed to occur. 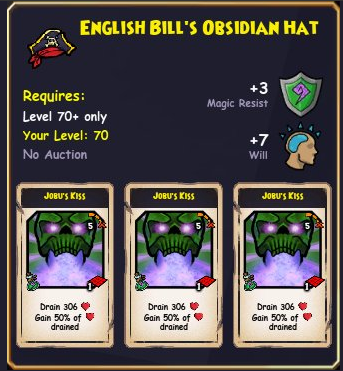 English Bill’s Obsidian Hat- This hat gives +3 magic resist, +7 will, and 3 copies of Jobu’s Kiss (aoe drain, heals back 50%). Jobu’s kiss is very powerful against summons or other bunched up units. If you can reliably hit 3-5 units with these aoes, they will easily heal you back as much as a rouse or a rally. Thus, I don’t see this getting any mainstream attention, but it will be a good option to counter witchdoctor and privateer summons. Obsidian Hoodoo Wand– This wand has 180 weapon power, 5 range, and two copies of Jobu’s breath. The Nefarious Staff and Fall Champion’s Scepter are FAR better options than this due to the summons they provide. 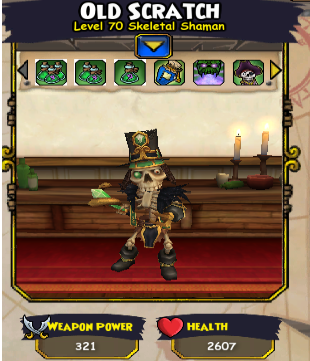 In addition, Moo Manchu’s Wand and Phule’s Wand have more range than this wand. However, this is better than every wand or staff in the game that I haven’t previously mentioned. 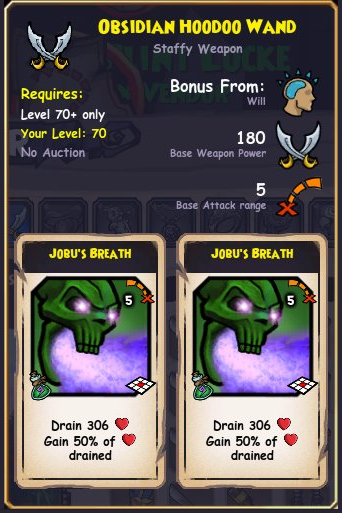 This might see some play from witchdoctors (a small chance that privy uses it), but witch tends to not run out of attacks very often, so the Jobu’s Breath won’t be used very often. However, if these copies of Jobu’s Breath were copies of Jobu’s Kiss, this would probably see play somewhat often. Captain Blood’s Obsidian Hook and Obsidian Deathdealers- Both of these weapons, according to Decius, are bugged and will be fixed in a coming test realm patch. This could include improving their damage and/or range, so I can’t evaluate these effectively in their current state. With proper upgrades, the epic talents they provide are compelling enough for them to potentially see play, so keep your eyes out. Readied Spell’s range has been changed from weapon range + 1 to a default 2 range. This makes it more akin to overwatch, which shares a default 2 range. The board in spar chamber was big enough and replete of obstacles enough for readied spell’s old version to pretty much always trigger, regardless of the weapon’s range. However, in most ranked arenas, the boxes in the middle of the map would block sight and prevent readied from triggering frequently on 5+ range wands. This range reduction makes it much harder to avoid readied spell triggers in ranked pvp, but witchdoctor’s relatively low accuracy makes this change much less impactful than it otherwise could have been.